An author's bio and contact information appear at the end of articles and reviews on HumanHand.com. Additionally, authors can receive $25 USD for each article or review accepted and published. Human civilization, since prehistoric ages, has evolved as a society with a great inclination toward occultism or esoteric knowledge of the world of spirits or supernatural forces. People who mastered the occult or the �hidden belief� inscribed the medium of communication among the inhabitants of esoteric world in the form of some unique symbols with hidden meanings. These are the perceptible signs of invisible power of natural forces or satanic influences which are mainly used by the occultists to manipulate the natural laws to satisfy their own benefits. Among these symbols Horned Hand, which is quite similar to the Karana Mudra of Eastern religions, is depicted as a form of raised index and pinky fingers describing the devilish sign of a beast. 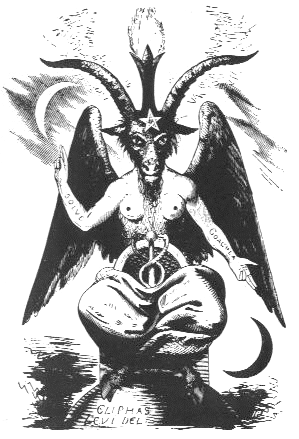 Horned Hand is believed to be the depiction of the woolly Goat of Mendes or Baphomet, or the Horns of Cernunnos which has long been portrayed as a synonym of Satan or a demon. Raised index and pinky fingers symbolize the horns and tightly closed middle fingers and thumb represent the mouth of the goat. In Italian the Horned Hand is named as �Mano Cornuto.� This hand sign is often inscribed on charms to protect the user from evil eyes. As per contemporary Italian tradition if this hand gesture is pointed toward any man it suggests that the man is a cornuto or a cuckold. It is believed that the association of Horned Hand with the sign of infidelity has been originated from Minotaur, the legendary monster from Greek mythology who was the progeny of Crete queen Pasiphae�s adulterous relationship with a white bull. There are two types of Horned Hand gestures. The first type is meant for right hand. In this gesture the thumb should be kept under the clenched middle and ring fingers. This hand sign signifies the horned god of witchcraft. The second type of gesture is meant for left hand. In this case the thumb should be kept over the middle and ring fingers. This hand sign is usually used to curse someone by pointing Horned Hand gesture toward the person. In many western countries the Horned Hand symbol has become an exceedingly popular hand sign. This symbol is often inscribed on amulets or used as an apotropaic gesture to ward off the ominous influences of evil eye. This hand sign is quite similar in its use to other satanic hand signs like hamsa hand, hand of Fatima, hand of Miriam, the eye-in-hand, the mano fico or fig hand, and two-hand gesture with interlocked thumbs. Americans having Italian ancestral background are the avid performers of this hand gesture who deliberately use this charm for getting magical protection from the intentional or directed curses. People from Brazil and Argentina do also believe in the use of Horned Hand sign for fending off ill fate by conjuring some supernatural power. Nowadays Horned Hand gesture has become an inevitable part of the American Heavy Metal and Rock. 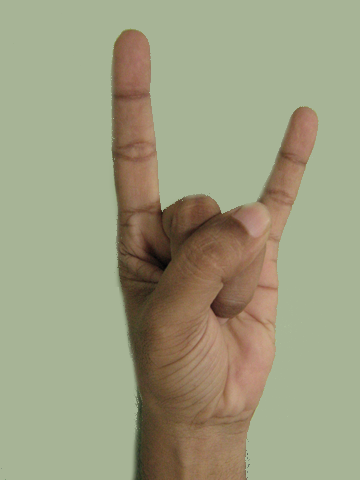 This hand sign is well-known as devil sign, metal horns, or �Rock on!� sign. It is quite difficult to predict who has brought about this evil sign to make the acquaintance of American heavy metal ecstasy. In 1969 Chicago-based psychedelic-occult rock band Coven released their album �Witchcraft Destroys Minds and Reaps Souls� where they used an image on their back album cover showing their members giving the sign of �mano cornuto.� They are known to use this �devil�s sign� always at the beginning and end of each concert. 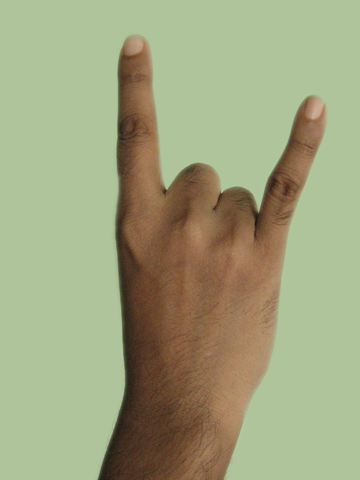 Heavy metal singer Ronnie James Dio of Black Sabbath band was known to share the primal credit for popularizing this hand sign among the metal fans for the first time across the world. Dio, in his childhood, saw his Italian grandmother to make this sign to parry evil eye and got attracted to the magical incantation and the irresistible devilish attitude of raising horn sign. In 1978 before joining Black Sabbath he took up this hand gesture in an attempt to connect the fans with a declaration of high testosterone and sending out a jolt of love, hence making them crazy in front of their metal-god. Irrespective of origin and purpose of Horned Hand gesture metal fans all over the world have embraced this hand sign as a mystique metallic evil symbol which soon cast its overwhelming spell over millions of fans of the Rock world. This omnipresent hand sign is widely used by the rock music lovers to signify that the concert has won their enthusiastic plaudits. However in Hinduism the Horned Hand gesture made with a left hand is sometimes considered as �Abhayamudra� or �Gesture of Fearlessness� or �Gesture of Blessings.� The same concept of Horned Hand sign has been adapted by the people of Asian Buddhist countries. The Chinese Hung Society cherished Horned Hand sign as the emblem of membership. They also use it as a sign of �Man� who symbolizes both heaven and earth. 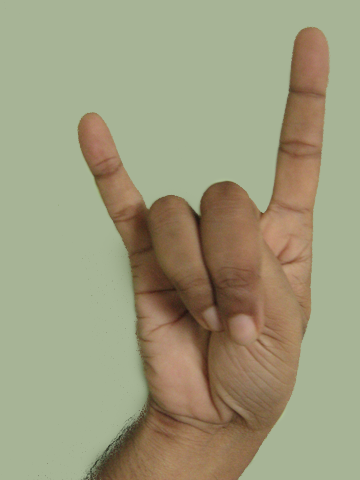 People in European countries like Albania, Slovakia, Czech Republic, Greece, and Malta generally use Horned Hand sign as a gesture of infidelity. In this regard people of these countries are quite influenced by Italian belief. In Turkey the horned hand sign is used to signify wolf�s face where two raised fingers symbolize wolf�s ears. Besides being used as an occult symbol Horned Hand gesture is also quite popular in different parts of America for its use in sports without invoking any demonic association. Subhabrata Das is a freelance writer and editor in India. He has been interested in astrology and palmistry since childhood. HumanHand.com is written by Kenneth A. Lagerstrom. © Copyright 2008 Red Phoenix Productions.